4 bedrooms • 127 m² • € 350,000 k.k. Behind a beautiful “Statenkwartier” façade located unique 5-room double upper house of approx. 127m² with 2 balconies. 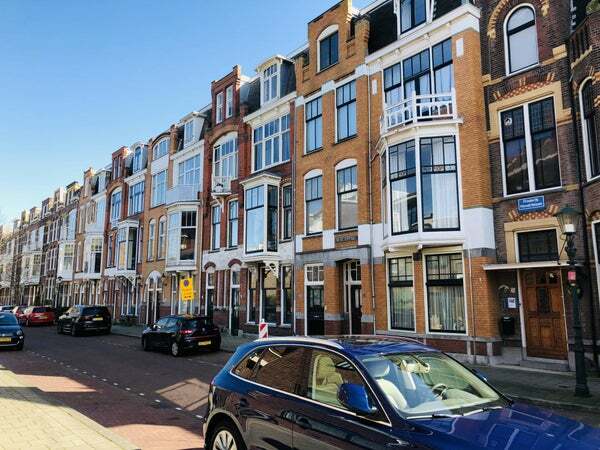 This property, located on the second and third floors, was designed by the well-known architect Jan-Willem Bosboom from The Hague and is beautifully situated in the heart of the beloved Statenkwartier district with the famous Frederik Hendriklaan shopping street around the corner. The house has a lot of potential, but after 40 years of habitation, it requires a thorough maintenance! The Frederik Hendriklaan is in the Statenkwartier traditionally one of the most important neighborhoods of The Hague. The neighborhood has a typical diagonally wide street pattern with lots of greenery and large intersections that gives the neighborhood with the stately mansions its chic appearance. Leading national and international organizations specialized in, among other things, law and business services are located within walking distance. A great deal is being invested in modernizing the Statenkwartier with respect for the preservation of the cityscape. This makes the Statenkwartier a neighborhood that is characterized by above-average value development. Common entrance at street level, stairs to first floor, landing, entrance apartment, stairs to 2nd floor. spacious hall. toilet, large hall cupboard, bathroom with shower and sink. spacious living / dining room ensuite with patio doors to spacious balcony. Very spacious front room now classified as a kitchen with sliding doors to small front balcony. stairs to the 3rd top floor via the central hall. landing, two bathroom with double sinks. Spacious front bedroom and very spacious rear master bedroom. - The building was designed in 1912 by the well-known architect Jan-Willem Bosboom from The Hague. - a lot of light and a view due to the open location. - age and materials clause applicable. - m² € 350,000 k.k.